So here it is…the most exciting part of the event! 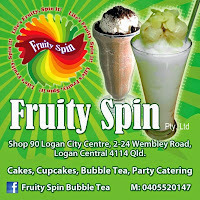 Now I will take you on a visual tour to show you some of the yummiest stalls in Brisbane Good Food and Wine Show 2014…. Ilias the Greek Stall have the most wonderful characters looking after the stall. Warm and friendly you can’t help but be drawn to their stall with them handing you toothpicks of their warm sweet Honey Puffs and delicious Halva pieces. I love the extra ambience their Greek music creates as it pumps out from their little sound system, if there was an award for the most happy atmosphere stall it would be won by Ilias the Greek Stall. Brisbane Good Food & Wine Show was held last weekend (17-19 October) and I had an awesome time during the event. Saturday was a tight squeeze around 1-2pm and the waiting lines with the food trucks were insane but Sunday was more relax with lots of bargain/sale on offer. I’ll be breaking my post on this food event into 2 parts as I went mad on taking pictures during my 2 days visits….yes, you heard it right! Thanks to Square One PR, they provided me with a media pass which I can use during the duration of the show and I hope the 3 ladies who won those double passes did enjoy their visit during the weekend like I did. It has been along time since I have posted a Filipino Recipe….so to make amends, here’s a simple recipe for Ginataang Tambakol Steak (Tuna Steak cooked in Coconut Milk). I’ve added a few kamias to create a small souring effect on the overall taste of the sauce. I find that this dish is quite good when you break up the tuna steak and tossed in cooked pasta or in a mix salad and use the sauce as the dressing. I do hope you give this Busog! Sarap! recipe a try! I saw this YouTube link from my FB newsfeed….it was inspiring and and also a good example if you want to start a business. Like in the video you have to learn like Nin…..to observe, analyse, try out, be innovative and face problems with courage. This is also what I’ve been trying to show my daughter, Ms M since she was small and to my 2 sons. Such a good video that I have to post it to Busog! Sarap! and it got fruits too, so it’s counted as food related, don’t you think? Winners of the Good Food & Wine Show 2014 Double Passes…. Congratulations to the winners of the Good Food & Wine Show 2014 Double Passes! Last Sunday the TRIBE visited another Filipino Food Establishment that recently opened in Browns Plains called Bodega Grill. I’ve booked a table just in case and requested a highchair for our energetic youngest, Samboy earlier that day. What happened the previous day, happened again this day….the TRIBE were late again due to the fact we’ve circled the area a couple of times before finding the place. Thankfully it was not that busy when we arrived at Bodega Grill. Bodega Grill has a very simple decor and casual dining/takeaway atmosphere. When we arrived we were happily greeted by the lady owner and quickly shown to our reserved table with our requested highchair….A+ on my scoreboard! UPDATE 15/03/2015: Due to some interesting discussions with one of the owners in FB Busog! Sarap! Page, I have decided not to mention this Filipino Eatery somewhere in Redcliffe real business name due to the fact that I was accused of not asking permission on taking pictures of the place. The day we dined in this establishment…I did asked permission from the lady in the reception before we were seated (specifically asked if I can take photos of the buffet area even though we are ordering A la carte), was told it was fine and asked again (allowed again) when I paid the bill, I have witnesses. I remembered because after I paid for our bill, I asked for a receipt and the lady in the reception desk have to handwrite it down because they only have a basic cash register that time. I even told her to pause for a bit from writing and settle the bill of the next customer after me as I don’t want them to wait too long. During this time I took photos of the front of the reception desk and entrance while she was finalising the bill of that customer. Now come on… I was using a freaking dslr camera (hard to miss) and our table was just across the reception desk during our visit there. During this long weekend here in Brisbane, the TRIBE spent half of the Saturday in Mooloolaba for some needed day out on the beach, the weather was absolutely fantastic. We got our dose of Vit. D, sea air and sand everywhere. While snacking on a Fisherman’s Basket Meal around 4pm, I’ve convinced Mr H to drive to Redcliffe before heading home to Brisbane to check out the newly opened Filipino Eatery that I’ve seen popping details in some of the Brisbane Filipino based FB Pages. We already prepaid the Gateway Toll fee might as well kill two birds with one stone, I say. So I called for a 5:30-6pm A la carte booking and reserved a table for the TRIBE with a highchair. From Sunshine Coast, I under estimated the travel time and we arrived around 6:30pm but didn’t reach Filipino Eatery until 7pm as we were circling the area looking for it and most of the time GPS and people don’t talk the same language…lol! The area where we were able to locate a car park space was on the side of some park….it was dark so can’t really tell where we are at. Once we arrived we found the lady at the receptionist counter very friendly. I apologised for our group’s lateness and explained that we’ve been circling the area a few times before finding the restaurant. She showed us our table which was just opposite the reception counter and a table away from the shop front glass big windows. I’ve asked for my reserved highchair but sadly someone’s using it as they have only one highchair for the entire premises if my hearing was right. This Filipino Eatery has warm decor ambiance which was really nice. I love the bamboo wall…. As we settled in our table, we observed that it was not really packed that night as some of the tables were vacant but it seems that their buffet was really popular as we are the only one as far as we know have ordered A la carte that evening. Ms M and Ms P (after visiting the girl’s room) told me that there was a party happening in a closed section of the restaurant. The lady in the reception told us we are welcome to have a look at their buffet area just in case we might be interested on getting buffet instead of A la carte. Mr H had a look and in the end we both agree that we are sticking to our initial choice. Plastic A4 Display Book was handed to us to browse on the menu (pls. scroll down this post for the menu). Ordering segment for our table was a bit confusing, first we have to ask the lady from the reception who is going to take our orders. Waiters came all at once and then disappears… things that were needed in our tables we have to chase it up with the lady from the reception or if we are lucky, stop one of the waiters if they happened to be in our area. I want to be positive….even with this hiccups, after all this Filipino Eatery just opened last 20th September 2014 and I do accept there would be some early problems for the first few weeks. Mr H and I might be wrong how we read the menu but this is not Inihaw na Baboy to us but Pork Bbq. This picture shows that the pork they have used is not pork belly as it looks leaner and Inihaw na Baboy in our personal opinion are slices of pork belly marinated in vinegar, pepper and soy. Taste wise this dish was passable, nice marinade taste overall. On the Menu it said: Inihaw na Baboy~ Bbq Marinated Pork Belly on a bamboo skewer but then they have another one listed as Pork Bbq~ Bbq Marinated Pork Tenderloin with authentic Filipino spices on a bamboo skewer served with vinegar/soy dipping sauce spiked with crushed chilli and calamansi. I never had sudden outbursts when ordering from a menu before but this time, I can’t help but expressed my disbelief when the waiter told me how much an individual serve of steamed rice…..it was AUD$6, so folks the picture above was AUD$12. Take note, Mr H even scolded me for fussing over the price of the steamed rice with the waiter….I said to the lines of “are you kidding me? $6!!!! about 3x times. I have to fix one of the sprig of parsley as it has toppled over during the trip from their kitchen to our table before I took the picture…am such a stickler to order. The noodles were well flavoured but the menu stated that this dish was “Stir fry Egg and Rice Noodles with pork, chicken, shrimp, mushroom and mixed vegetables”. Now that I’ve stared at the Menu closely….same description as their Bam-e. In this dish they overdid the string beans and celery. Ms P stated that the cut of vegetables for their Bihon Guisado was wrong, celery was cut into chunky pieces and string beans were too long. When this dish arrived one thing Mr H and Ms P asked the waiter was where was the raw egg on top of the sizzling Sisig Baboy, as there were only 3 big dollops of mayonnaise to make this dish creamy, sorry to say peeps…it doesn’t come with an egg. This dish was too wet that the bottom was burnt from the sauce instead of crispy, it was an okay dish. Mr H thinks it taste more like a saucy Bopis…lol! This is an individual serving of their Special Fried Rice, same taste as what you can get from any Chinese Restaurant/Takeaway. I call this the “Dancing”Crispy Pata….when this dish arrived without sauce to our table, it has slided on one corner of the square plate. I can’t help myself but swiped the crumbs and push the Crispy Pata with my fingers to centre it on the plate for photo taking purposes…we have to chase up the sauce and fork/knife for this dish. It was crispy but the meat inside was a bit chewy and the sauce lacks flavour. Ps…Mr H said that some of the meat was chewy because it was a bit on the pinky side. When you walk further inside Filipino Eatery, you will see the buffet area, kitchen, bar and karaoke section. The interior of this restaurant was nicely done, from all the Filipino Restaurants and Takeaways we’ve been to here in QLD….Filipino Eatery is by far the best looking one. This Filipino Eatery offers Red Horse and San Miguel Beers along with their house wines and local beers, so you all “Mangiinom” (Drinkers) out there take note! TRIBE’S FOODIE VIEW: We can’t fault the interior and ambience this restaurant creates with their shop fittings but as we all know that in order to survive in this kind of business you need good customer service and most of all… delicious food that will make the customers keeps on going back for more. Special mention to the lady in the receptionist area as she was very friendly, accommodating and very approachable. She should stay in the reception area and not have to do some of the waiter’s job as her role is very important, she greets and shows tables and settles the bills. We think she’s doing a fantastic job!
. Waiters~greeting your customers before taking the food/beverage orders doesn’t hurt. You can say “Good Evening, Welcome to Filipino Eatery….I’m (name) and I will be your food or beverage attendant this evening. How’s your day so far? (with a beaming smile…not a confuse look).
. The waiters need more training and should have certain roles inside the restaurant eg. clearing, beverage and taking orders for A la carte menu. The tables near the front of the restaurant looks like its been neglected, hardly any waiters go around there to check on customers.
. Once food orders are placed on the tables, waiters should come back 1-2 minutes to check on the tables just in case the customers needed something else and to make sure everything is fine. For example, our mains where placed on our tables but most of the food don’t have serving utensils and a sauce was missing which was an integral part of Crispy Pata. These things should be checked before the waiters carries the food onto the customer’s table.
. Mr H have to chase one of the waiters for water refills. He requested the female wait staff who came by to refill our water glasses if she can leave the water jug on our table but she apologised that she can’t as they don’t have enough water jugs to go around. Won’t it be much easier for the establishment to purchase those water bottles with stoppers like the ones they serve in Cafes.
. Waiters should handle plated food carefully to avoid food & garnishes slipping/rolling on the plates.
. Dirty plates and empty glasses should be collected as soon as possible, to make the tables neater and cleaner specially on buffet nights. Btw, the drinking glasses were a bit greasy….
. Please use a much solid menu folder and tidy up the menu list with correct descriptions of the dishes. It won’t hurt too, to add 1-2 more additional high chairs. This review is not an attack but merely an observation from the customer side. If we ever happen to be on the other side of the Gateway Bridge in the future, we will visit again in a couple of months (Update 15/03/2015: we will never visit again !). I do hope Filipino Eatery somewhere in Redcliffe will be a success once they overcome these food and customer service hiccups as we want a Filipino Restaurant to be successful and we can be proud of here in QLD. Win double passes to Brisbane Good Food and Wine Show 2014! Brisbane Good Food and Wine Show 2014 will be rocking up this coming 17-19 October in Brisbane Convention and Exhibition Centre. For 3 days, 9am-5pm daily you have the chance to explore the Show, from participating in masterclasses or just discover/taste what our local farmers, producers and winemakers have to offer. This year’s Show will feature regional producers from every corner of Queensland so you can discover local labels you won’t find in the supermarket. Meet and greet some of the finest food artisans, from Gympie to Northern NSW and sample what could be your new pantry must-haves.